1 of 3 Bring a large pot of salted water to a boil. 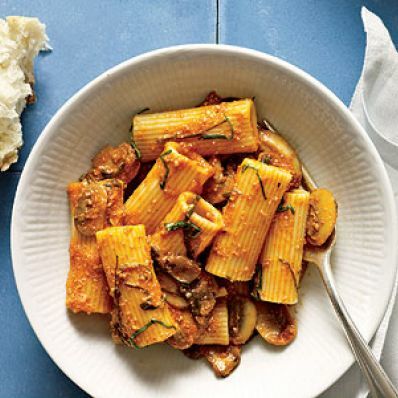 Cook rigatoni according to package directions. Drain and return to pot. 2 of 3 While pasta is cooking, heat oil in a medium-size saucepan over medium-high heat. Add mushrooms and salt to saucepan; cook 3 minutes. Add wine to saucepan and cook for 3 minutes. Stir tomato sauce, black pepper, ricotta and basil into pan until well blended. 3 of 3 Pour sauce over pasta and stir to combine. Serve immediately, garnished with additional fresh basil, if desired.